Athens is a university town that’s rife with Southern charm and home to the country’s first state college — the University of Georgia, which ranked as one of the top 100 universities in the world last year for utility patents granted. After the celebrated university was chartered in 1785, the now-bustling city sprang up around it. The campus’ Old College building, originally called Franklin College, is one of the oldest buildings in Athens. The picturesque city of about 115,000 has 40 nightlife hotspots, 15 neighborhoods on the National Register of Historic Places and has a surprising tie-in to music history, as the native stomping grounds of R.E.M. and the B-52s. For day trips or more weekend entertainment, Atlanta is just a 60-mile drive away. 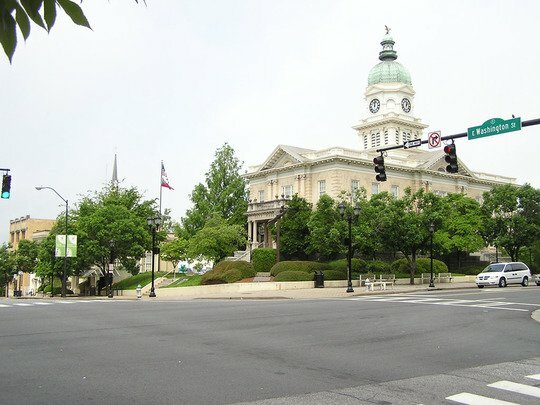 Athens-Clarke County is geographically the smallest in Georgia, which is good news and bad news for the apartment search. Just about any neighborhood you choose will be located near the University of Georgia campus, but these apartments also tend to lease quickly before the semester begins. For the best options, start your apartment search at least two months before you hope to move. The rental landscape in Athens is wonderfully diverse, meaning you can grab a luxury apartment with a swimming pool, gym, and common areas included, or rent a townhouse or entire home — all within a student-heavy community, so you’re always surrounded by like minds. Public transport in Athens is an easy, affordable option. Athens Transit, the local bus service, is provided free to UGA students, but the service shuts down daily at 10 pm, so you’ll want to plan ahead if you’ll be heading back to your apartment late. The Campus Transit System, which is a great way to get around the 762-acre UGA campus, runs a bit later on weeknights. Bike lanes throughout Athens also make cycling a great option for students to get between UGA and their apartments quickly. Downtown Athens, naturally, is the heart of the action. Just northwest of the University of Georgia campus, the downtown area is where you’ll find local boutiques, restaurants, and pubs. If art and music are more to your taste, Athens is renowned for its art galleries and historic architecture. The music scene is Athens is also legendary, and offers acts that cater to all types of musical tastes. For an atypical adventure, check out the Dolphin Dive Center to get scuba certified, and join the group for a diving trip to Bermuda or beyond. For literal play, check out the Rush Athens Trampoline Park, which has an extreme dodgeball court and foam pits. Created in the Civil War era, one of the world’s only double-barreled cannons resides in Athens to this day. The highly experimental and quite unsuccessful weapon never saw combat, but it remains an Athens landmark nonetheless. The city is also known for its several historic home museums, such as the Taylor-Grady House, owned by the prestigious newspaper editor, Henry W. Grady, who dubbed the term the “New South” following the Civil War. The enormous 10,300-square-foot house is a National Historic Landmark. The T.R.R. Cobb House, formerly owned by the Confederate General Cobb, has actually been moved twice — to Stone Mountain and back again — since it was built in the mid-1800s. For a campus town, Athens has an incredible range of dining options, from high-end to affordable favorites. Mama’s Boy Restaurant is where locals love to have brunch, located right off Dudley Park and the North Oconee River. South Kitchen + Bar serves up a creative, modern twist on Southern food, such as their low country shrimp and grits. For restaurants with a cozier feel and flavor, try out Clocked Diner, a locally sourced and retro-inspired burger place, or Weaver D’s Delicious Fine Foods, which makes soul food easy to spot in their bright-green building. One year, The Globe, tucked into unassuming Athens, was named one of the best bars in the nation by Esquire magazine. An Irish-style pub, you can get a side of fish and chips with your beer. Speaking of, Athens is home to a handful of craft brewers, including Copper Creek Brewing Company and Creature Comforts Brewery, both of which offer entertainment in addition to a place to enjoy their beer. For high-end cocktails, try the Trappeze Pub, which is also known for its upscale pub grub. If you prefer to keep it simple, head to Five Bar, where you have five options in the food and drink categories. The 40 Watt Club — another Athens bar to get a national title, one of Rolling Stone’s Best Clubs in America — is a legendary local live music venue, and has played host to some huge names. The Georgia Museum of Art, the state’s official art museum, is located on the University of Georgia campus and was recently expanded to accommodate a permanent display of the museum’s full collection, as well as traveling and house-curated exhibits. The Athens Symphony Orchestra, Athens Creative Theatre, and the Athens Little Playhouse delight performance art lovers. And outdoors enthusiasts delight in the Georgia Museum of Natural History, home to 14 distinct scientific collections and the largest of its type in the region. Perhaps the annual festival that best encompasses Athens is AthFest, a three day event in late June that brings vendors, musicians and other art enthusiasts into the streets. Three outdoor stages hold live music, plus there’s a two-night club crawl that books 100 more bands all over town. Not too long after school starts up again in the fall, the city hosts Athens Intensified, another genre-crossing music festival. In October, the North Georgia Folk Festival — a music, arts, and craft festival popular with a wide demographic — is held at Sandy Creek Park. For roots music, check out the Athens Americana Festival each spring. Athens has a handful of shopping destinations, ranging from national retailers to unique indie shops. The downtown area is home to a large selection of speciality stores and galleries housed in historic buildings. For the upscale boutique shopping experience, you should head to the Five Points neighborhood, just west of the University of Georgia campus. The shops in this neighbourhood are tucked between vintage homes from the early 20th century. The shopping and the scenery are unmatched in the area. Beechwood and the Georgia Square Mall, both in western Athens, are where you’ll find the larger retailers and chains, as well as catch a movie and a meal. The Bulldogs power the sports scene in Athens. The Dawgs, through the University of Georgia, have a team for just about any competitive sport for men and women alike, including football, basketball, track, golf, and many more. To get the true Athens sports experience, head to the Tailgate Station, a “luxury tailgating” facility near the Sanford Stadium, where the Dawgs play. It has food, a stadium shuttle, entertainment, plus flat-screen TVs to still catch the game if you’re too settled into the tailgate to move. Even if you’re not that into sports, you’ve got to be at least a little curious about how luxurious tailgating can be. Without leaving the Athens city limits, there are great ways to get outside. Walk through lush, manicured greenery at the Founders Memorial Garden or the State Botanical Garden of Georgia, which is 313 themed acres on the Middle Oconee River. A walk in Bishop Park will give you 33 acres to traverse, plus athletic fields and a swimming pool. Athens also gives you access to Georgia’s Antebellum Trail, a 100-mile journey that winds through seven communities that survived General William T. Sherman’s March to the Sea. A half-hour northeast of Athens, the Broad River Outpost lets you plunge into slow or whitewater conditions for a weekend of camping and kayaking or canoeing.